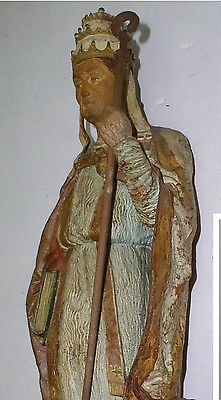 The statue is a depiction of Pope St. Sylvester I who reigned from January 31, 314 until his death on December 31, 335. Father Kunst suspects the statue to be about 200 years old. The image of Saint Sylvester I as pope is somewhat difficult to distinguish from the images of other sainted popes, all of them uniformly distinguished by papal robes, meaning the cope over their shoulders and the tiara on their head. What makes Sylvester recognizable are not objects but animals, a bull and a dragon. The bull, usually shown at the pope’s feet, is based on one of the legendary stories that have become part of his hagiography, according to which he brought back to life a bull that had been killed by a magician. The dragon that is sometimes shown near Sylvester refers to a dragon guarded by the Vestals that he subdued, holding the crucifix in his hand and enclosing it definitively in its underground lair.